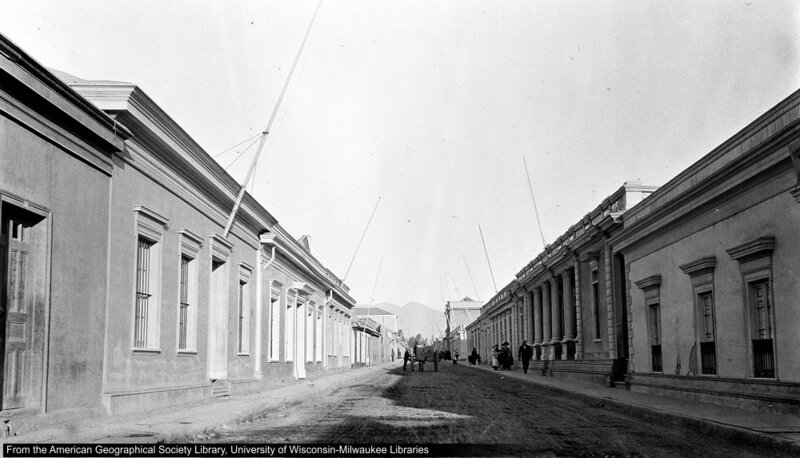 Original de Isaiah Bowman (1913): Street in Copiapo, with flag poles . Calle en Copiapó con astas de banderas, la casa de dos pisos al fondo corresponde al hotel de Atacama. (©): The American Geographical Society Library, University of Wisconsin-Milwaukee Libraries. - Digital ID: bo000755 ; Digital Collection American Geographical Society Library Digital Photo Archive - South America. ● The American Geographical Society Library, University of Wisconsin-Milwaukee Libraries. - Digital ID: bo000755; Digital Collection American Geographical Society Library Digital Photo Archive - South America.